Ken Yuszkus/Staff photo: Salem: Dumond Thebaud speaks about his work at the Salem Power Plant while being recorded on stills and video. Art students from Montserrat, Rebekah Segar, left, shows still photographs she took to Alicia Parent. 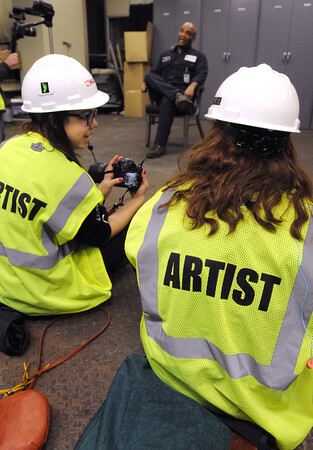 Art students are undertaking a project to document the experiences of workers at the plant.